Dill Pickle Deviled Eggs are an easy deviled egg recipe with the flavorful tang and kick of a dill pickle. This is a great party appetizer everyone loves! If you love deviled eggs and you’re also a fan of pickles, this recipe will knock your socks off. You know I love my deviled eggs. 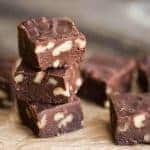 Any time I make them, my family gobbles them up so fast they start asking for more. Sure, I love me a good classic deviled egg, but more times than not I like to add extra flavor, crunch, and excitement to my deviled eggs. 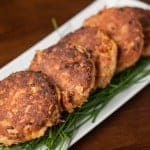 They’re such a good protein filled snack and the absolute best party appetizer you’ll find! 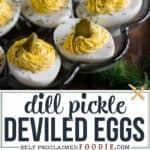 Why add dill pickle to deviled eggs? There are two reasons to add anything to deviled eggs – flavor and texture. Plain deviled eggs are certainly delicious, but they lack in the texture department. 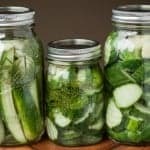 I make my own homemade pickles every summer and they are SO GOOD. The addition of chopped dill pickles not only adds a different texture to the creamy egg yolk mixture, but it adds additional moisture. The chopped pickle and pickle juice also add that tangy, salty flavor that every good deviled egg needs. 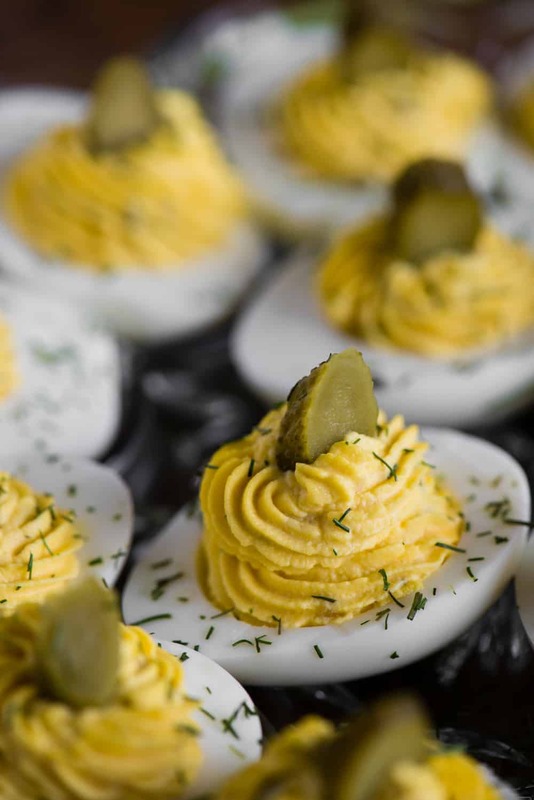 It actually makes so much sense to add pickles to deviled eggs. 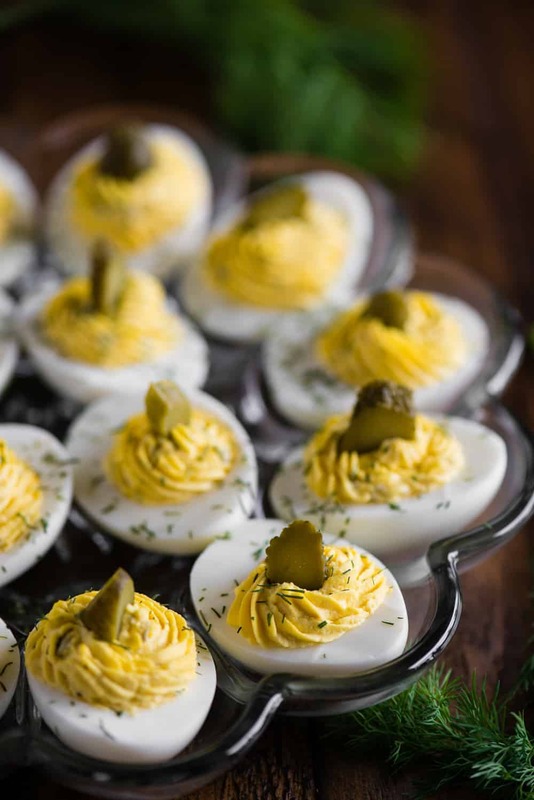 What do dill pickle deviled eggs taste like? These deviled eggs taste just like deviled eggs but with a subtle pickle flavor. The intensity of the pickle flavor really depends on they type and amount of pickles you use. The more intense you want your pickle flavor to be, the more pickle and pickle juice you’ll add. My version of dill pickle deviled eggs were relatively tame because my pickles weren’t overpowering. That’s why I like to chop up a crisp, intensely flavored cornichon for the top garnish. Not only does that tell me that pickle flavor is awaiting, but it adds that extra punch of flavor and crunch. How far ahead can you make deviled eggs? Some people might disagree, but I think deviled eggs are the best on the same day that they’re made. Once assembled and refrigerated, they can sometimes “sweat” and release a bit of liquid which I find a little bit gross. 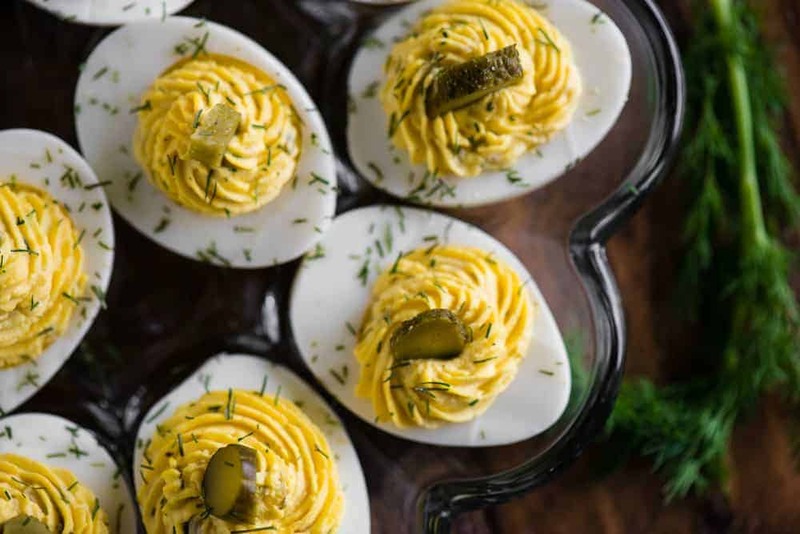 We do refrigerate and store any leftovers and they are certainly good for a few days, but if you’re making these deviled eggs for a crowd as a party appetizer, I recommend making them on the same day. Dill Pickle Deviled Eggs are an easy deviled egg recipe with the flavorful tang and kick of a dill pickle. This is a great party appetizer everyone loves! 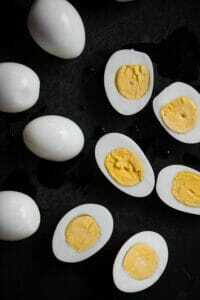 Add mayonnaise, pickles, pickle juice, and dill to yolks. Mash well with fork until smooth and creamy. Continue to add additional pickle juice, if needed, to create a very creamy texture very similar to a buttercream frosting. 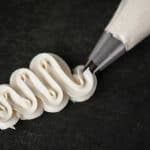 Fill egg whites with egg yolk mixture either by spooning it in or piping it in with a wide star tip. Sprinkle with dill and top with slice of cornichon before serving. These look so tasty and not complicated! I completely agree deviled eggs should be a same day thing! 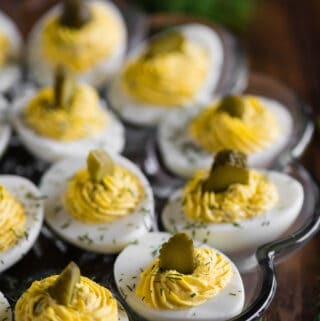 Great idea to use pickles for deviled eggs. Great for Easter! 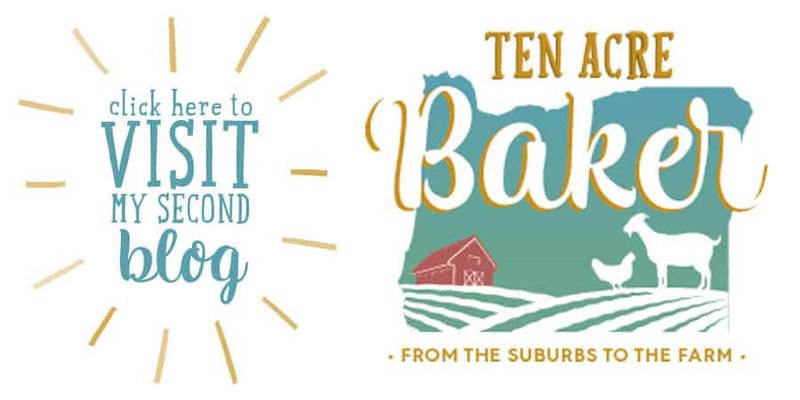 As a pickle lover and deviled egg fanatic, this is my kind of recipe! I just love the tang the pickle adds — so good! Thanks for sharing. I remember eating Deviled Eggs like crazy growing up! These look so perfect and I love that you’ve added dill pickles!